Updated tee perfect for laid-back casual days. 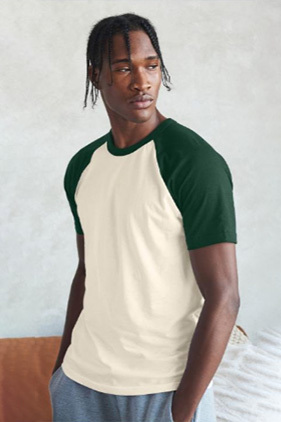 100% combed ring-spun cotton, 32 singles 4.3 ounce fine jersey raglan tee. 1x1 rib binded collar matches sleeve color. Contrast raglan sleeves and bound neck. Tear away label. (Heather Gray - 90% combed ring-spun cotton/10% poly).